There are 23 Assisted Living Facilities in the Belleville area, with 1 in Belleville and 22 nearby. The average cost of assisted living in Belleville is $2,260 per month. This is lower than the national median of $3,346. To help you with your search, browse the 127 reviews below for assisted living facilities in Belleville. On average, consumers rate assisted living in Belleville 4.2 out of 5 stars. Better rated regions include Romulus with an average rating of 5.0 out of 5 stars. Caring.com has helped 7 families in Belleville find high-quality senior care. To speak with one of our Family Advisors about assisted living options and costs in Belleville, call (855) 863-8283. Bellevue is a village in Eaton County in the state of Michigan. With a population of 1,282, this tiny town is an idyllic retirement destination. Seniors make up 15 percent of Belleville's total population, and the area has a total of 41 assisted living facilities, with one in Belleville itself and the other 40 in nearby towns like Romulus and Westland. 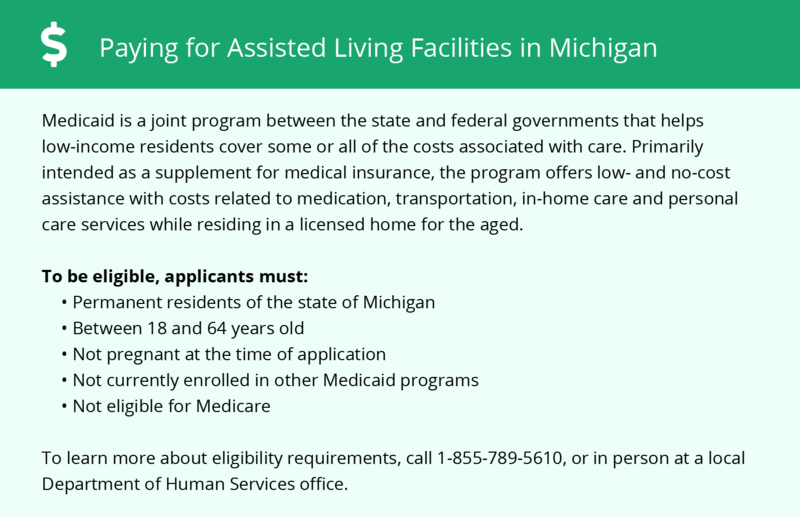 The Department of Human Services regulates assisted living in Michigan, which includes homes for the aged and adult foster care. A home for the aged is for anyone over the age of 60, while an adult foster care home is for any adult requiring special care. Belleville is located in Wayne County, about 29 miles southwest of Detroit. The average low temperature in Belleville during January is 18 degrees, with an average high of 32 degrees, making winters hard on seniors sensitive to the cold. The average temperature range during July is between 63 to 85 degrees. The overall cost of living in Belleville is comparatively low at 90 percent of the national average. Housing is the biggest reason for this difference since it’s only 74 percent of the national average. All other essential expenses in Belleville are within five percent of the national average. Belleville’ overall crime rate is relatively high since it’s only safer than about 19 percent of the cities in the United States. However, the rate of violent crime is very low in Belleville, at 1.56 per thousand people per year. The annual rate of violent crime for Michigan is 4.59 per thousand people and 4.0 per thousand for the United States. Seniors in town on errands or appointments should exercise caution. The Wheels for Independence Program is responsible for transporting senior citizens and disabled people in Belleville. These buses and vans operate on Mondays, Wednesdays and Fridays. The Van Buren Township Senior Center provides many activities for adults over 60 in Van Buren Township, which surrounds Belleville. This senior center maintains a full schedule of games, exercises and classes. It also provides medical, legal and community services for seniors. Belleville has few facilities from which to choose in the event of a medical emergency or illness, with the nearest major hospital located in Dearborn. Assisted Living costs in Belleville start around $2,260 per month on average, while the nationwide average cost of assisted living is $4,000 per month, according to the latest figures from Genworth’s Cost of Care Survey. It’s important to note that assisted living rates in Belleville and the surrounding suburbs can vary widely based on factors such as location, the level of care needed, apartment size and the types of amenities offered at each community. 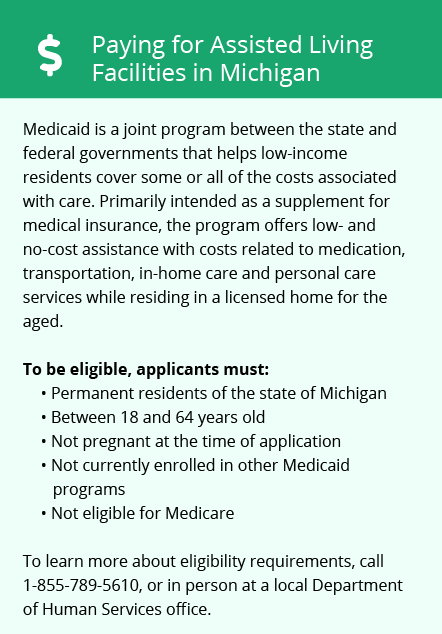 Michigan’s Medicaid State Plan provides a range of personal care services for senior citizens, including homes for the aged. The state also provides recipients of supplemental security income with an optional state supplement that places a cap on room and board charges, provided they reside in a home for the aged. Belleville and the surrounding area are home to numerous government agencies and non-profit organizations offering help for seniors searching for or currently residing in an assisted living community. These organizations can also provide assistance in a number of other eldercare services such as geriatric care management, elder law advice, estate planning, finding home care and health and wellness programs. To see a list of free assisted living resources in Belleville, please visit our Assisted Living in Michigan page. Belleville-area assisted living communities must adhere to the comprehensive set of state laws and regulations that all assisted living communities in Michigan are required to follow. Visit our Assisted Living in Michigan page for more information about these laws.